Two Bears Farm and the Three Cubs: Where's Cort? I gave Cort a book by Cornelia Funke (her Ghosthunters series) and told him he might like it. I was doing a bunch of chores around the house and realized he was missing. Things were so quiet. And quiet moments in my house are few and far between. Reid had been working at a coloring project at the dining table, and Pierce was at Renaissance camp. I called for Cort. There was no answer. So I had to track him down. Cort was so wrapped up in his book that he didn't even notice when I snuck a picture of him with Bobby. Cort is Bobby's chosen person, so I tend to always find the two of them together. An hour later, Cort emerged, and asked if I could order him the second book in the series from the library. You bet, Cort! awwwww. Isn't it odd how critters, especially cats and dogs, pick special people as their favorites? I remember reading some of those books to my son. Love moments like that.. and you are doing such a great service to your children when you encourage them to read. Mine were sporatic readers, but when they found a series they liked, they devoured them. Don't you love it when they get that interested in a book? Love this pic of Bobby hanging out with his human. 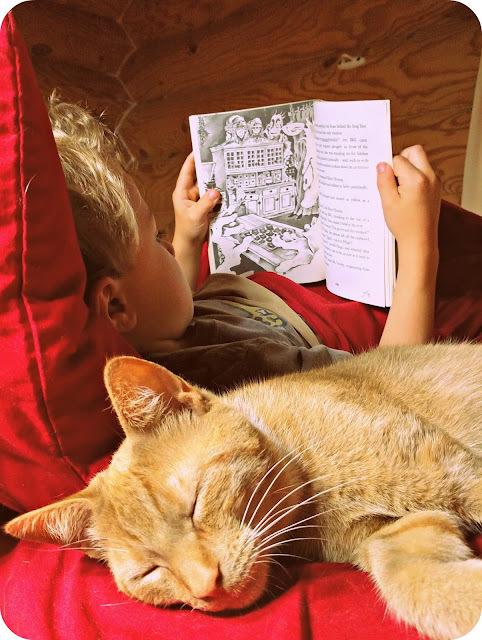 Book, cat, quiet--one of the best combos. So neat that he's gotten the book bug..."there is no Frigate like a book to take us lands away"...E. Dickenson..
That's awesome! A proud mama moment, for sure. I told my grandkids last week that I was going to build them a library in one of our rooms for them. The oldest likes to read and the youngest is not too crazy about it, although he's an excellent reader. I'm hoping by stocking their little library shelf with things he's interested in will make the difference. When I was a kid, the schools used to have "summer reading programs." You could go to the school with your mom or dad and check out books from the school library to read together. I don't think they do that anymore, but in your household you obviously have your own good reading program. I still remember reading "Fire Hunter" by Kirkengard, Roy Chapman Andrews book on finding the first dinosaur eggs, during his expedition to Mongolia. "The Wind and the Willows." Reading is great for everyone, but especially necessary for kids so they develop the life long habit. This is THE cutest picture EVER!!!! I love it! It has every element of awesomeness: the love of reading, the comfort of a close companion. You sure know exactly what your boys like. Gosh, Cort reading books like this, he sure is growing up fast. I hope he always keeps that gorgeous hair! One of the most beautiful sights I know of is that of a child wrapped up in a book. I love to see kids into books. Isaak's rarely into them, but when he is it's so nice. Mica has to be told to stop reading to do other things at times. He's a book worm. That Renaissance Camp sounds fun! I have great memories of doing the same thing as a younger person. Good for Cort! What a beautiful photo of the two of them! isnt reading magical... and when they find just the right book - i can watch on in awe too! Aww, that's a sweet shot of him and Bobby. Readers are leaders- that's my thought on the subject. Reading was my chosen field in education and was my most favorite part of the day with my first graders. Marvelous picture! I used to carry tall piles of books home from the library.